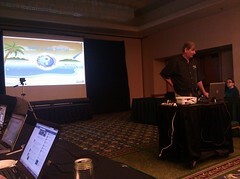 Day 3 of our “Best of Search Conferences 2011” is upon us, and this post wraps up the series here on our blog. Looking through the coverage, one thing we can say for certain is that there are a ton of enthusiastic, brilliant people in the search marketing community who have a passion for sharing ideas. Thanks to all of them, and special thanks to the conference producers who offer a vehicle for these people to share knowledge with the community. Today’s Day 3 coverage is all about exploring thought-provoking topics in the areas of understanding your audience, holistic marketing, online reputation management and branding, plus cutting-edge topics from this year’s search marketing events. Check out Day 1 and Day 2 if you happened to miss them. And, here we go! The evolution of search has progressed from being 10 blue links on a search engine results page (in the beginning) to behavioral and personalized search for a better user experience. Google now tries to determine the most relevant results based on prior search history, and social search is the next wave of personalization. It’s becoming harder as SEOs to report rankings when behavioral search comes into play. Bruce Clay, Inc. has found the Google API to be inaccurate. Predictions are that Google is going to dominate the SERPs at an individual level, personalized to each searcher, and confuse the user to the point where he/she will not know whether it’s organic or paid results. In the social search world, there are many factors that remove fear, uncertainty and doubt in shoppers and make people accountable for the content they share. Review sites move shoppers to buyers; social sharing of content makes a person more careful with what they endorse – bad content does not get links, good content does. If we are socially involved, and do it right, the links will come. Social media communities feed people better than just “alerts”; there’s an increase in people who prefer social media for information consumption over browsing. Almost half of the people who access social media sites do so via mobile. And it’s not that people are spending more time on mobile; it’s time they wouldn’t spend on a computer that they are now spending on their phones. Some social media signals for ranking include: authority of the sharer, how quickly and how often the content is shared; the share text (what it says); what personas are doing what sharing; and the concept that Facebook“ likes” are the new links in search. When building a social media community for a brand, listen to the community and the customers before coming up with a strategy. They might want something totally different in a community than what is being provided. It’s important to do an assessment of the brand, the industry and the conversation surrounding it first. For search and the U.S. Hispanic audience, blend offline efforts with online search marketing; studies show more than 75 percent of the U.S. Hispanic audience searches for more information from something they saw on TV – with Google being the favorite search engine. And mobile search is big within this community. Use Google Insights to compare Spanish queries to the general market to find opportunities. Analytics tips for the Latino audience includes using needs-based segmentation – security, power, esteem, change, for example – which is harder and less obvious to target than language segmentation. Use psychographics profiles for online purchasing segments to figure out who the real decision makers are and reduce assumptions about the audience. Allow for Web navigation and ads in both Spanish and English to reach this market. Personas are an important part of the search marketing process; there’s a difference between a searcher persona and a product persona, and one person can morph into different personas throughout the cycle of a search. Personal data mixed with keyword data (how the person searches online) creates the ultimate persona. Know what your business goals are before the SEO strategy in order to best tap into personas. Don’t chase the newest, shiny toys in search marketing. You need a mix of tactics, but content is where you need to put your efforts to be successful. Approach search, social and content with the audience’s needs and preferences in mind to secure wins. Produce content that fulfills all areas of the buy cycle that any given audience goes through so no opportunities are missed. Start thinking like a publisher to be good at content marketing. The evolution of Internet marketing has left us to believe that it’s not about what’s happening on websites anymore – it’s what’s happening outside of them in social networks that matters. But, not everyone has time for social media upkeep, so apply an 80/20 rule – 80 percent automation and 20 percent personalization. You can do this with the right tools and strategy. Facebook use spans international borders, with 70 percent of Facebook use outside the U.S. This presents a vast opportunity for marketing globally through Facebook. Other tips for sharing information and content in a social world includes creating a digital cloud around your connections, then your connections’ connections and so on, and use this to create the strategy to help decide what headlines, language and images to include, for example. In mobile search, trends uncover opportunities for mobile marketing, including what people are looking to accomplish when using their mobile devices to do something online. This includes marketing for the location of the user and the time of day for relevancy; allowing the user to complete a task easily; and giving the user opportunity to save money through mobile offers. Use search to protect a brand’s presence online by applying what’s called search engine reputation management. This includes using traditional search marketing tactics to create strategies that will create an online experience that’s synonymous with the brand. SEOs and user experience engineers now have to work more closely than ever before to survive Google’s mission to make search better for users. To figure out what metrics matter to Google, put yourself in the shoes of Google, this likely includes things like the Google G-Bounce rate (return to the search result and then the following actions as well), query behavior after a G-Bounce, average time before a G-Bounce, click-through rates and repeat visits. To create a social media program that works and protects the reputation for large companies, there needs to be a training and on-boarding process that starts with defining what social media is to that company and how it fits into the brand, and refresh the training annually, ensuring it goes to employees, partners, vendors and execs. White Hat SEO builds marketing value because it’s aimed at creating a strategy that fulfills intent. Many Black Hat SEO tactics can be transformed into White Hat tactics; it just takes some fresh perspective to eliminate the risk factor and turn it into something that provides lasting value. Mobile barcodes (QR codes) present an opportunity to track things we may not have been able to before, like print media, and it also gives opportunity to blend online and offline efforts. A good QR campaign serves a business objective, creates a valuable user experience and provides contextual assistance around the campaign, so users know exactly what to do and how. This year, Bing rolled out adaptive search, which is essentially behavioral search on crack [those are my words – Jessica]; it learns from a user’s behavior beyond just one search session. But personalized search does not mean SEO is dead. On the contrary, it makes the SEO’s job easier. See, a business doesn’t have to be the “best” at one thing; it just has to be the most relevant for the query and who is looking for it. The main language of the Web is HTML. With the advent of HTML5, it goes hand-in-hand with what people are doing, seeing and wanting from the Web. And search engines like Google are totally behind it. HTML5 is usable, but don’t be afraid to experiment and fail – it’s still a work in progress – but there are many benefits to implementing it. Daily deals companies are growing in numbers, but they aren’t as profitable as one might think. In order to make a daily deal offer work as part of the marketing plan, there are some things beyond the deal that should happen. Because the purchase is at a low margin by the customer initially, it requires high customer lifetime value to make up for that initial purchase. To help this along, offer a quality product people will want to come back for, and use aggressive social marketing to retain those customers. Social media signals allow for the greater personalization of search, and the confusion surrounding ambiguous queries has been alleviated, as have many ad-targeting problems. Rankings in the search engine results pages are affected by social signals as well as click-through rates, with reports showing Google +1s displayed alongside results have been shown to impact it. Google will be using social media as part of an ever-developing way to make sure results are becoming more and more relevant to users. While many Web marketers have been using social media marketing for some time, the understanding and adaptation of it across big and small businesses alike still has a ways to go. The good news is, social media marketing used to be considered a soft science, but is now measured in terms of ROI with hard-number values assigned to it. Looking at social media as if it were something totally new and unmanageable can make it seem more intimidating than it needs to be. The truth is, social media is just an evolution of the way people have been marketing for years, but now allows a two-way conversation between a business and its audience. Definitely need to get to one of these conferences! But until I do, these recaps are absolute gold. Thanks! Thanks, Angie — appreciate the kind words! (I have to give a shout out to fellow liveblogger Virginia Nussey who also worked her fingers to the bone for all this coverage). And thank YOU for all the great info from your presentations at search conferences over the year. Look forward to many more.